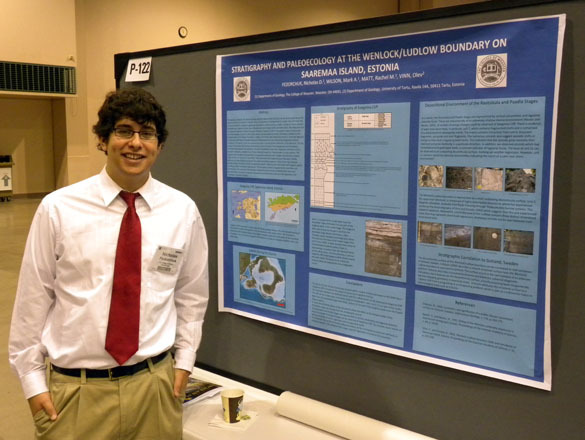 MINNEAPOLIS, MINNESOTA–The first Wooster students presented today at the Geological Society of America annual meeting. Above is Nick Fedorchuk who talked about his work in Estonia studying the Wenlock-Ludlow boundary on Saaremaa Island and its implication for Silurian stratigraphy and depositional environments in Baltica. 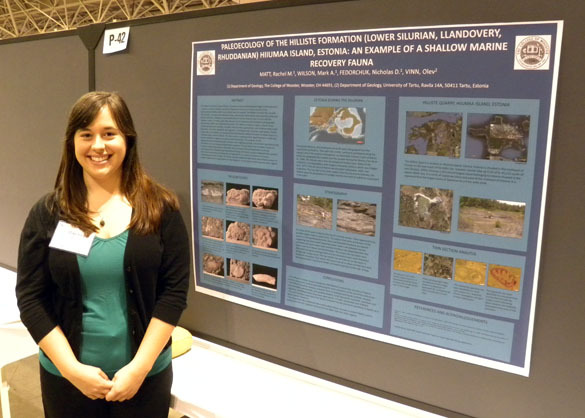 Rachel Matt (above) presented her work on the Lower Silurian fauna found in the Hilliste Formation on Hiiumaa Island, Estonia. 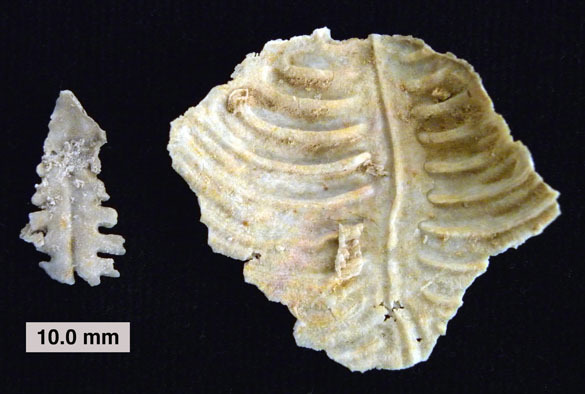 These fossils are critical evidence for the recovery of marine communities following the end-Ordovician mass extinctions. It was fun watching Nick and Rachel interact with geologists who stopped by to see their posters. Not only did they learn a great deal about the rocks and fossils they are studying, they could also see how they fit into larger questions about Silurian plate tectonics and evolution. Two other Wooster students also showed posters today: Lindsey Bowman and Andrew Collins. Photos and profiles of their work will be posted later. 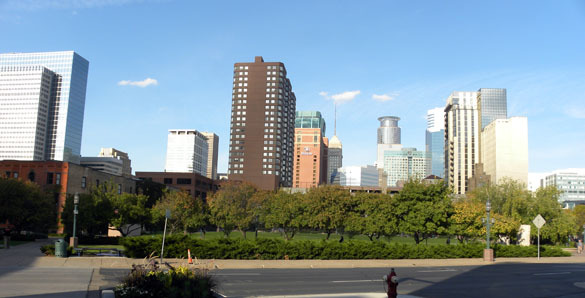 MINNEAPOLIS, MINNESOTA–Wooster Geologists are again attending the annual meeting of the Geological Society of America in force. It is strangely very warm and sunny here in mid-October Minneapolis. 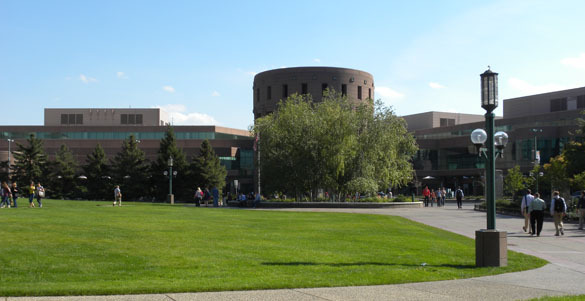 The convention center looks like a late summer college campus with people sunning themselves in grassy gardens surrounding the convention buildings. We have all four faculty and six students at the meeting this year making various presentations from Sunday through Wednesday. We will soon show you our students giving poster presentations, along with comments on the meeting itself. Minneapolis skyline from the Convention Center. Note the blue sky! Funny word to apply to a fossil: aberrant, meaning “deviating from the normal”. It’s an old-fashioned word rarely used these days, primarily because we have a hard time defining “normal”. It was the word used when I was introduced to the above brachiopod, though, so I employ it in honor of my old-timey professors. On the left is the dorsal valve exterior and on the right the ventral valve interior of Leptodus americanus Girty 1908. (Both valves are broken.) This species is a member of the Family Lyttoniidae in the Order Productida, which some of my students may have just figured out. The large ventral valve relative to the reduced dorsal valve is the clue. The specimen was found in the Word Limestone (Wordian Stage, Guadalupian Series, Middle Permian System, about 265 million years old) in Hess Canyon, Texas. It is replaced by silica (“silicified”) and so was easily extracted from a block of limestone by dissolving away the calcium carbonate matrix. These brachiopods, along with many other types, lived in extensive reefs in west Texas during the Permian. The ventral valve was cemented to other shells and extended out parallel to the substrate. The much smaller dorsal valve fit into the grooves, leaving much of the soft-part interior exposed. My professors said it was “like a leaf in a gravy boat” — and I had no idea what a “gravy boat” was then. It is likely that Leptodus americanus had photosynthetic zooxanthellae embedded in its exposed mantle tissues. These are protists (most often dinoflagellates) that live inside the tissues of metazoans and provide them with nutrients and oxygen in return for carbon dioxide and a cozy place to live. Reef-forming corals are the best known animals to have such a mutualistic symbiotic relationship with zooxanthellae today. It would thus not be surprising to see a similar system with these reefal brachiopods. Not so aberrant after all. Girty, G.H. 1908. The Guadalupian fauna. United States Geological Survey Professional Paper 58:1-651. Williams, A. 1953. The morphology and classification of the oldhaminid brachiopods. Washington Academy of Sciences Journal 9: 279-287.